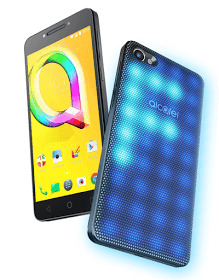 Alcatel has launched yet another awesome smartphone called Alcatel A5 LED, that has LED bulbs that glows at the back. There's also an inbuilt app that you can use to set them to glow with notifications. Alcatel A5 LED is a 4G LTE smartphone with 5.2 inches screen size, a fingerprint sensor, 2GB RAM + 16GB inbuilt memory. It also has other back covers; one is an additional battery, while the other is a speaker with stand. The Alcatel A5 LED also features an octa-core Mediatek chip. See the full specifications and price below. Launch Price: Expected to cost EUR 200, roughly $211 in USD and N92,000 in NGN. Alcatel A5 LED specifications. Alcatel A5 LED released date. Alcatel A5 LED price in Nigeria, USA, Europe, India, Kenya.